Views inside our modern factory. Including members of our highly skilled workforce. 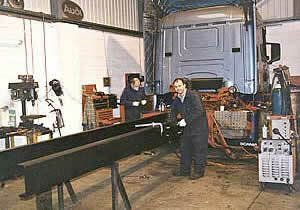 Duane and Nick fitting a lifting tag axle assembly to a MAN tractor unit. Duane is a highly skilled fabricator welder. Nick is our wiring specialist. Remember all our wiring joints are soldered and double shrink wrapped – not crimped and insulation taped – proved to be much more reliable in service. 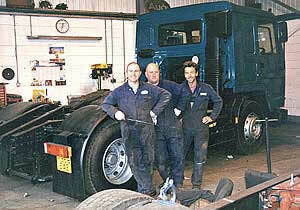 Work about to commence on converting this Volvo tractor unit into a long wheelbase 6x2 rigid chassis. Dave, Gary and Andy can't wait to get started. 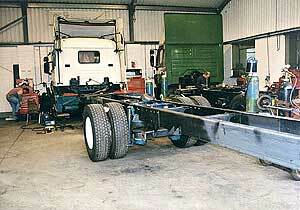 Nearly completed, SCANIA tractor unit into long wheelbase 4x2 rigid chassis, suitable for use as a horsebox. 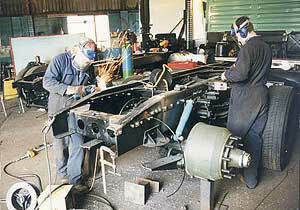 Remember all our chassis joints are vertical up welded, not downhand. This is for greater penetration and strength. Gary and Dave again working on this SCANIA tractor unit which will become a short wheelbase 6x2 chassis suitable for tipper operation. 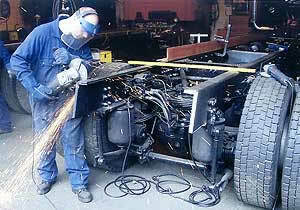 Dave and his angle grinder with double thickness chassis. Reverse channel main sides. 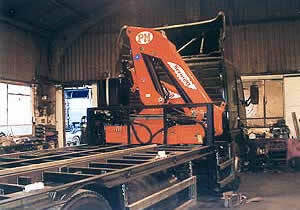 Farm machinery low height body with 'Stinger'. Bearers pierced through channel runners for low height.